Community Connections – Page 2 – Our Stories Matter…. In addition to the work Family Scholar House does hands-on with our scholar-parents and their families, there is also the work FSH does in the Louisville community (and beyond) to be a voice for those who have sometimes have no voice. On behalf of our single moms and dads and their children–our family–we are committed to speaking up when it comes to the devastating effects of poverty, homelessness, and domestic violence. Community involvement, leadership and education matters to us. To that end, this summer, Family Scholar House is launching a pilot Serving and Learning Day Camp. Designed to help middle-school aged youth think about their place in the world and how they can be agents for positive change, the day camp will include a mix of education, play and service. We’re excited about this new venue for impacting the Louisville community! Below you’ll find all you need to know if you or someone you know might be interested in the day camp. Take a look–and pass it on! This coming June, Family Scholar House, a Louisville-based non-profit whose mission is to end the cycle of poverty by providing single-parent students the support they need to earn a four-year college degree, will be piloting its very first day camp for rising 7th and 8th grade youth. The camp will include service at local mission organizations, poverty and justice education and awareness, and an opportunity to meet with and learn from Family Scholar House residents. The camp is limited to 12 participants in this inaugural year, and will be led by Julie Richardson Brown, FSH Community Integration Coordinator. Julie will be assisted by various volunteers and community leaders. To register, or for more information, please contact Julie: jbrown@familyscholarhouse.org or by phone at 502.584.8090. Upon registration, a detailed schedule will be provided as well as any necessary paperwork. 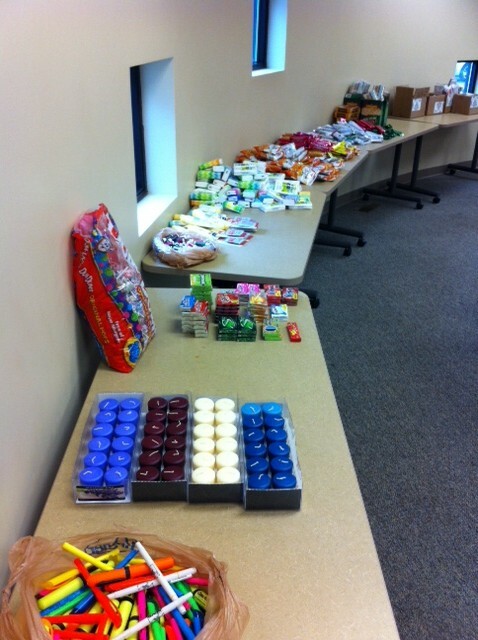 Sorted donations waiting to be assembled into care packages. Imagine a room full of boxes of donations: individually wrapped granola bars, trail mix bags, gum, mints, Chapstick, Kleenex, highlighters, hot chocolate, tea bags, Starbucks instant coffee…. The list could go on and on. And imagine enough volunteers to organize, sort, stuff, write, decorate and assemble all of this into 167 finals care packages for Family Scholar House residents. 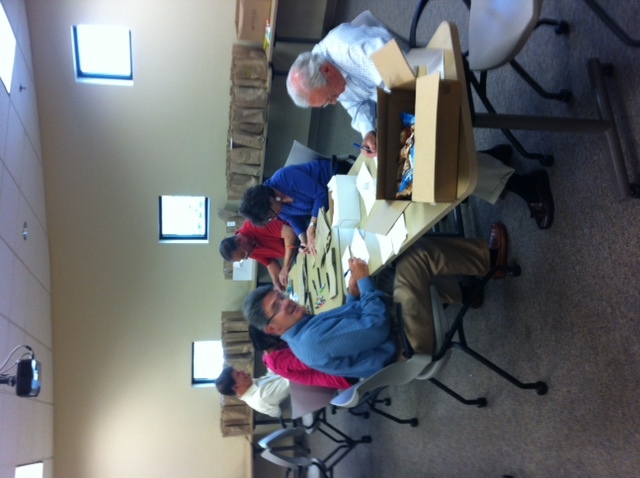 Leadership Louisville volunteers decorating care package bags. That volunteer, and others like her, through their donating of items and their hands-on putting together of the packages, helped remind FSH residents that someone cares. That their empowerment and success matters to the wider community. That they do, in fact, have a village of support surrounding them in their academic pursuits and their journeys as parents. 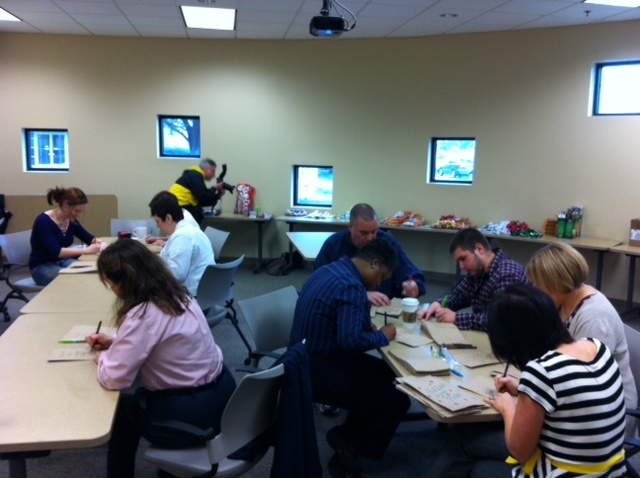 ID+A staff writing notes of encouragement to go in the care packages. It is yet another example of the deeply held belief of Family Scholar House that what we do, we do together–and when we live life together, we live life at our best. Thank you, to all our Give-A-Day Mayor’s Week of Service volunteers–you’ve made a difference in the lives of our scholar parents! Thirty men and women from the wider Louisville community have volunteered to enter into mentoring relationships with thirty Family Scholar House residents. It is not a requirement for the residents, and there is no compensation provided to the mentors. In other words, it is entirely voluntary on the part of both the mentor and the mentee. Nobody has to be doing it. Last week, some of those mentors and mentees gathered for a social of sorts–pizza, conversation and games at our Louisville Scholar House campus in an effort to help everyone to get to know each other. At first, it was like any room full of folks who don’t know each other–quiet, tentative, no one completely sure what to expect. But then the pizza arrived. And the children started playing with one another. And iced tea and salad were served. And everyone sat down at long tables to eat together. And in just a few minutes the room got very noisy. Conversations erupted all over and laughter ensued. It was as if everyone had suddenly realized that the person next to him or her might well be their new best friend. As dinner wound down, the FSH staff member leading the event invited everyone to play a game. Playing a game is not always easy for adults–especially adults who’ve just met–but there they were, mentors and mentees, engaged in a mini speed-networking session designed to help them connect with as many people in the room as possible, even if just to exchange their name, favorite movie and most-desired place to visit in their lifetime. It went so well, that the staff member had to insist that it come to an end at the appropriate time–and even then, side conversations kept going as people exchanged phone numbers and email addresses and finished up last bits of talking. Nothing lasting may come of it. Or something life-changing may come of it (we’re banking on the latter!). But either way, in the hour of space provided for those mentors and mentees to meet and greet one another, new relationships were formed. And, what we know at FSH is that when new relationships are formed, especially out of a common desire for good, the possibilities for growth and learning and mutual sustaining friendship are endless! Because for us, it’s all about the relationships–the circles of support and caring that build up the walls of this place and build-up the lives contained within these walls. These relationships matter. They are part and parcel of our stories as those who are Family Scholar House–and for every new member of the family (whether staff or volunteer or resident or pre-resident or child or donor) we are truly grateful. A successful, driven and respected sales associate for a major print and marketing communications firm, Karen was normally very prepared for first-time meetings with potential clients. This time, however, she was coming off an especially busy week and found herself not quite ready. “That was me,” she said, and went on to tell Cathe her story. How she’d found herself unexpectedly pregnant just prior to beginning her freshman year of college. How the baby’s father hadn’t wanted much to do with it all. How she was determined to get her degree, to excel, to chase her goals, even though everything was about to change and she had every reason to back away from her commitment to college. How the baby came a little early and so she missed finals her first semester and had to make them all up after Christmas. How her family pitched in and helped. How friends, anonymous strangers, even professors, all, each in their own way, cheered her on when it all seemed so impossible. Cathe understood. The meeting was a very successful one. And Karen is now a committed friend to and partner with Family Scholar House. She’s the original member of the FSH “Spirit Team,” volunteers who focus on FSH families and how community and energy can be built among them. FSH “finals baskets” are a brainchild of Karen’s, as are Easter Egg Hunts (the eggs being filled with things like baby food or granola bars) and any number of other special projects that help our families remember how supported they are, and how much of a community they have in one another. Karen’s own story intersected with the story of FSH in such a way that everyone learned a little bit more about what it means to work together for a good and common cause. And as Karen will tell you, we’ve got plenty of spirit around this place as a result! That’s the thing about Family Scholar House and our stories–we’ve all got one. Every staff member, every volunteer, every family–we’ve all got a story about why FSH matters to us. Karen’s is just one. “It’s like a circle!” she said…. The books were donated from those known and unknown. Some came from The Temple’s annual used book sale. Some came from high school seniors at North Oldham High School eager to do their part and help. 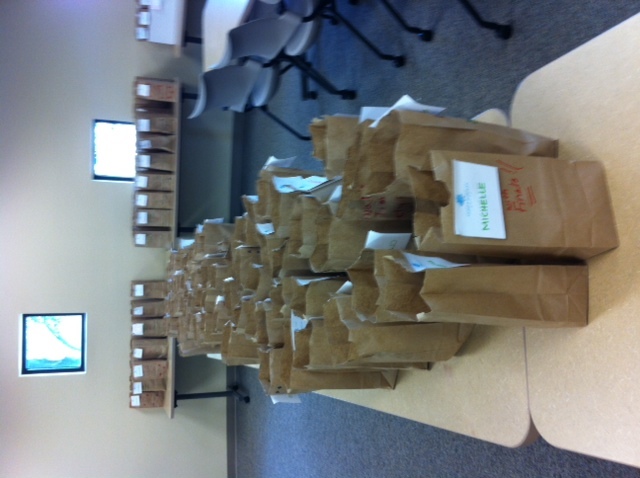 Some came as the result of Christ United Methodist Church’s Fall Into Reading event for FSH families last November. They’ve come from individuals, groups and families all over the state of Kentucky and beyond. We’ve had these books for a while now, dreaming of the day when they could finally line the shelves of the reading room at FSH’s Stoddard Johnston Scholar House campus. Thanks to SJSH nearing completion enough to house the books, and the University of Louisville’s Martin Luther King, Jr. Day of Service, produced by the Engage Lead Serve office, today became the day. The project isn’t quite done–there is still alphabetizing and organizing and straightening to do, but the hardest work has been graciously and joyfully completed at the hands of fourteen young women and their UofL staff advisor. Halfway through their work today, one of the young women approached the FSH staff person on site and said, “Ma’am, what are you going to do with the books you don’t use?” In corner of the room was a growing pile of duplicate books and their fate had not been decided. More than one Family Scholar House kiddo has known the care of Kosair Children’s Hospital. And more than one FSH family has known shelter at Wayside Christian Mission. Knowing these two important connections, the staff member shared them with the student. And yes. As a matter of fact it is a circle: a circle of donated books and selfless service and shelter in times of need and care in times of sickness and a way forward when there seems to not be any such way. This is what it means to work together–out of relationship–on behalf of those who need some help, that new opportunities might be made known and new ways of being might be lived into. With appreciation for all the folks at Gray’s Bookstore who support and encourage the mission of Family Scholar House! Chris Merrifield, Director of Operations for Gray’s College Bookstore, has both a vision for how community can be encouraged and why it matters so much that it is. He is also a faithful supporter of Family Scholar House. Walk into his university campus store and you’ll see on multiple surfaces FSH posters and photographs. And at the front entrance, a big barrel where college students finished with high-priced textbooks can donate them, either to be sold on the Internet (with partial profits benefitting FSH) or given directly to FSH student-parents who need them. Accompany him across the street to a new store, just now opening, and you’ll find space that is dedicated to both unique retail and, perhaps more importantly, community. He’s envisioned a place where people want to be—where they have space to drink coffee or study or talk or write or dream or imagine or just simply belong. Chris knows that community matters, and that everyone needs a community to call their own. And this is why he understands FSH so well, why he gets that at the heart of what happens to those who participate in FSH’s programs is a realization that they are not alone. That someone cares. That no matter where they’ve been or what they’ve been through, there are people willing to stand in the trenches with them, and help them find the tools they need to climb out. The truth is not a one of us navigates this life without the guidance and direction and support of those who have gone before us, and those who surround us in our day-to-day living. For the single-parent students at Family Scholar House, men and women who have seen the worst life can mete out, this truth is known. For those of us who’ve been lucky, who’ve had everything we needed along the way, this truth is sometimes harder to learn. And in between what is already known and what must be learned lies the very important work of Family Scholar House. It takes whole communities to do the work of this place, men and women and children from all walks of life working together towards a common goal. And the relationships that spring up along the way are testimony to a way of being we’d all be better off paying attention to. She’d been looking at me intently for the twenty minutes I’d been speaking, clearly paying close intention, even raising her hand to ask questions every few minutes–questions that indicated a level of familiarity with Family Scholar House I’m not used to seeing when I talk with teenagers about what we do. Something about her seemed vaguely familiar, but I couldn’t imagine where I’d seen her before, how I could possibly know this young woman. I must have looked so confused, because she quickly covered for us both, “I was visiting someone.” Before I could follow-up three more of her classmates had asked questions of their own and I turned my attention to them. Her teacher and I both turned to see the young woman pointing excitedly at the FSH material, “Right there! My aunt! She lives right there!” as she jabbed a finger at a picture of Louisville Scholar House’s apartments. And suddenly it clicked. The young woman had definitely seen me before. And I her. And her aunt is certainly a resident of LSH. And a few weeks ago, I took a visitor to FSH to her aunt’s apartment for a tour, and my young Seneca friend had been there helping babysit her aunt’s children. This young woman’s aunt is one of my new heroes in life–a woman who struggled enough on her own but who still, against all odds, took in and eventually assumed custody of two children who are biologically her cousins. She didn’t want them to end up in the foster care system. She knew they needed stability. She wanted for them to be with family. So she made room for them her life and now they all live at LSH while she, finally, pursues that dream of a college degree. I smiled big, my excitement matching that of my young friend, the rest of the class drawn into the loveliness of the moment, too. The teacher grinned, squeezed my shoulder, knew herself that something special had happened. Too soon, the bell rang and the moment was lost–but not before it had settled into my heart, bringing a whole lot of hope with it. Before my day at Seneca was over, three more students made sure I knew that they had a friend or a family member living at Louisville Scholar House, all of them so pleased and proud to have a connection to what they were learning about in class that day. Such amazing circles of connection and influence we cast–even if completely unaware we’re doing so–and somehow, out of all of it, comes this realization of how closely bound we really are to one another after all. Even if there weren’t school supplies stashed away in office corners, donated backpacks lined up smartly along office walls or FSH program participants filling the computer lab stations much more frequently, you’d still know that fall and a new academic year have descended upon Family Scholar House. It’s just in the air–the same way leaves turning from green to gold and russet have a sort of familiar and promising scent to them. Interns have arrived in full force. The phone rings even more than it usually does, and the traffic through offices and around both the Louisville and Downtown SH campuses is heavier. Plans are underway for for the annual Luncheon, for Halloween, for Thanksgiving, for the holidays of all sorts…. Never mind a new residential facility on its way to completion! It isn’t uncommon to feel as if you’ve landed on a speeding train, unable to slow down or hop off long enough to catch your breath and make sure you’re headed in the right direction. There is just a whole lot happening around here these days, and while we celebrate and give thanks for every bit of it–because it all points to good things for both our families and our community–it’s easy to get a little overwhelmed. And, then, just when you’re in the middle of something really important–maybe data you’ve been struggling to find the time to enter and organize, maybe a grant you’re writing a first draft of, maybe an email you’ve been searching for time all day to send and, finally, you have it–it is, inevitably, then, that the phone will ring again. And you’ll reach for it with a sigh…. There’s silence on the other end, and you can hear the unmistakable sound of a very frightened human being trying to fight back tears so that she can answer your question. And then we remember (as if we could ever really forget…. )–then we remember why it is we do this work–why the long hours, the hectic days, the full email inboxes and the constantly flashing voicemail indicator lights. Then we remember why this work matters, why we’re fortunate to get to do it at all, why being part of this place means being part of making a difference. We do it for her. And for her children. And for every other parent and child like them who has wondered too long and too hard how they’ll ever find a way forward from the difficult, scary and seemingly impossible place they’ve landed in. We don’t ever really forget–sometimes, though, we remember with greater clarity, with renewed energy, with confidence and with hope.